The house is just trying to protect the stick family from this intruder, the present. yeah, he seems to be. You really enjoy making sad games. I guess Ursa was a little more uplifting. Yeah I am thinking it might be the main character, the spike hitboxes are quite small. easy game for babies, try doing some better gameplay. But sound and graphics were just right. Haha funny, since the person before you thought it was way too tough. Yeah balancing this was tough. Was starting to think making it physics based puzzles would have been fun. Please add some checkpoints. The game is too difficult. BTW How long did it take you to make this game? Maybe 10 hours. Yeah, I was thinking of making you restart at the stocking if you made it. 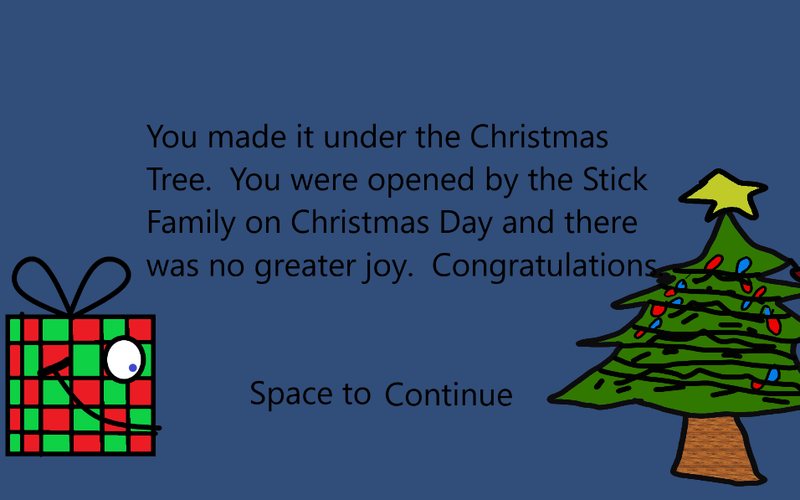 Did you make it under the tree in time for Christmas or was the house successful in protecting the Stick Family? Yeah, the game is quite tough.